Historic downtown Fullerton space offers traditional and fusion Mexican dishes and strong cocktails. 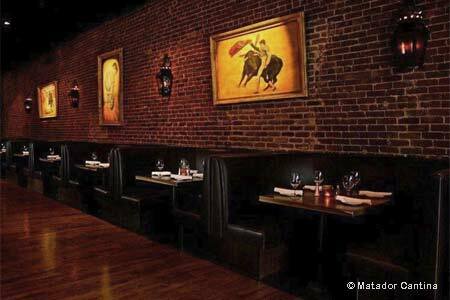 : Located in one of the oldest buildings in Fullerton (circa 1899), Matador has a sophisticated interior, with red-brick walls, romantic candlelight, leather half-moon banquettes, flamboyant red chandeliers, and a 50-foot wooden bar that is suited for catching the game on one of the flat-screen TVs. Chef David Dennis' menu features mostly traditional Mexican favorites, but also makes room for some good fusion dishes. First, however, start with a well-mixed cocktail like the strong house margarita or the jalapeño-infused martini. Then try the creamy queso fundido dip or the tostadas topped with ahi, avocado, cucumber and pepitas. Entrée standouts are the short rib chile relleno, the unique chorizo ravioli, and grilled flank steak topped with cilantro chimichurri sauce and pickled red onions. Don't miss the seasonal cake and chocolatey cookie fundido. On Saturdays and Sundays from 9 a.m.-2 p.m., an à la carte brunch includes a vegetarian omelet, fluffy pancakes and huevos rancheros. The venue's Agave Room sits adjacent to the main dining space and boasts a dedicated full bar and private dining for as many as 60 seated guests. Matador offers curbside service.